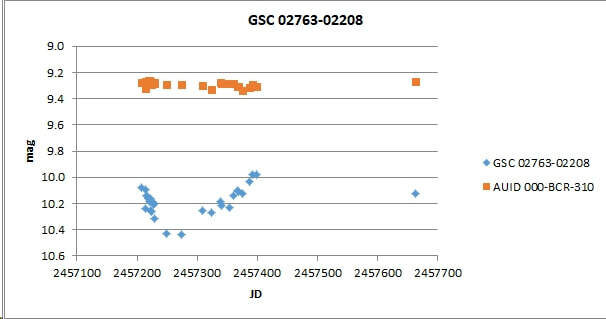 This light curve was confirmed as a discovery by me (my second) of a new variable star on Jan 27 2015 by the AAVSO. It was produced from photometry with AIP4WIN from 44 images taken with the Bradford Robotic Telescope's Cluster Camera between July 2013 and January 2015. 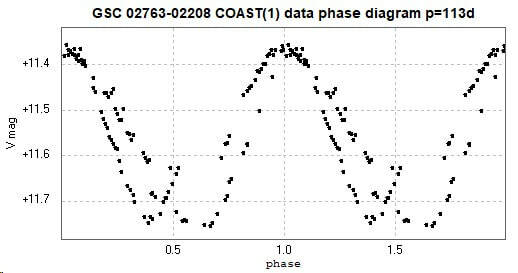 From my light curve and the star's previously known spectral class (M4), it has been classified as a semi-regular variable. It is in the constellation of Andromeda. These are red giants that expand and contract with a more or less regular period, and vary in brightness as they do so. They are similar to Mira stars, but they vibrate at an overtone rather than the fundamental frequency. It is too far away for its distance to be determined by parallax, but a back of envelope calculation based on its apparent magnitude and spectral class puts it at a distance of about 6000 light years give or take lots! From 39 images taken between 2013 07 02 and 2015 01 02 by Bradford Robotic Telescope Cluster Camera. Unfiltered. Comp = AUID-BCR-295 mag 10.0. 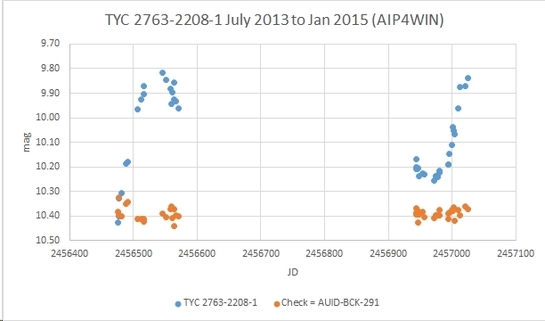 ​A few more results obtained from images of AB And taken with the BRT Cluster Camera, using their tri-colour green filter, between July 2015 and September 2016. The results have not been transformed. I requested images from the Open University Coast Telescope (a14 inch / 35 cm Schmidt-Cassegrain) between 2017 July 7 and 2018 August 22 through a V filter. 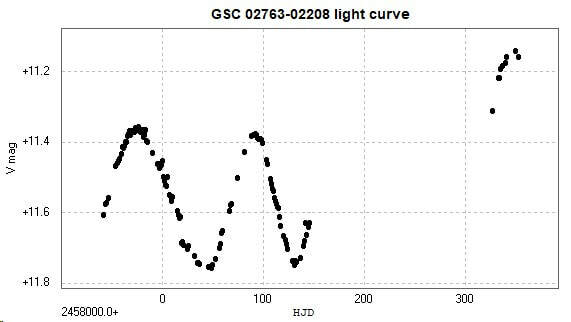 Photometry of the resulting 118 images generated the following light curve. The brighter 'max' segment after +300 days coincided with the introduction of a new camera on the telescope. However, this change of camera did not generate equivalent apparent changes in magnitude in other stars (eclipsing binaries) so it is shown here as representing the true magnitude of this star. More observations should help confirm the reality or otherwise of this apparent irregularity. 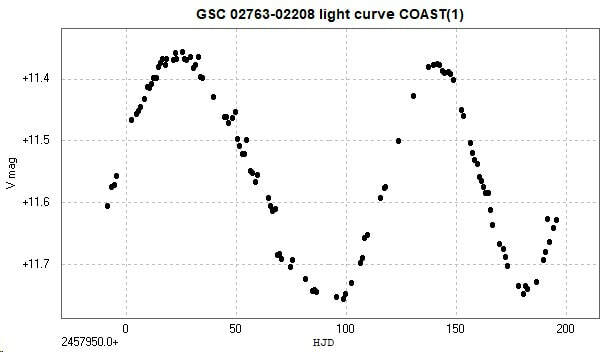 For the purpose of estimating the period of this star, only the first segment of the light curve was used. This, and the corresponding phase diagram, are shown below.